I warned y’all in my December 10 blog post, A lunch portends changes for LoGro. It’s now happening. I’ve got a contract with the City of Northfield, wearing my Wigley and Associates consulting hat, to create and manage the online platform for a City project: Developing a parking management plan for downtown. I’ll be teaming up with Ross Currier, Executive Director of the Northfield Downtown Development Corporation (NDDC). I’m pretty excited about doing this, actually. 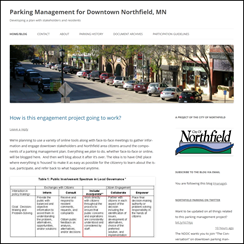 I hope you Northfielders who follow things here on LoGro will participate there, not only to help create a downtown parking management plan but to help me and the City get better at managing public projects which need a significant amount of genuine citizen engagement. I’ve got a parking straw poll up. And if you use your bike to commute downtown, come to next week’s meeting at GBM. Details in these blog posts. I’ll then blog the results, along with the submitted comments. We’ll then refer to it as needed when we started the focused blog discussion next week. * Pedestrians to meet, offer input on downtown parking. What’s a walking shed? For the next week (and maybe longer), we’ve got three focused blog discussion threads active on the parking management plan for downtown site. Do you live downtown? Do you live near downtown? Then you’re invited to a meeting to discuss parking issues, Mar. 28, 8 pm at the library. Details here. In yesterday’s Northfield News, reporter Kaitlyn Walsh (@NFNKaitlyn) has an article titled Downtown Northfield parking conversation nears its end. You can comment on my Downtown Parking blog post about the article here. The Draft Report on the Downtown Parking Conversation is now up. blog comment thread now open thru May 3. See the blog post with the Downtown parking management report, recommendations and documents for June 18 Council meeting.